MAGNUS (AUS) (Bay 2002-Stud 2008). 4 wins to 1200m, AJC Galaxy H., Gr.1. Sire of 405 rnrs, 285 wnrs, 15 SW, inc. Malaguerra (BTC Cup, Gr.1), Magnifisio, Great Shot, Enbihaar, Platinum Kingdom, Magnapal, Prince of Brooklyn, Miss Promiscuity, The Alfonso, Volcanic Ash - Volcanic General (Mal. ), The River, Malibu Style, Alpha Beat, Missy Cummings, Prettyhappyaboutit, SP Magnufighter, Streets of Avalon, Princess of Queens, Gredington, etc. Ash Grey (g. by Wanted). 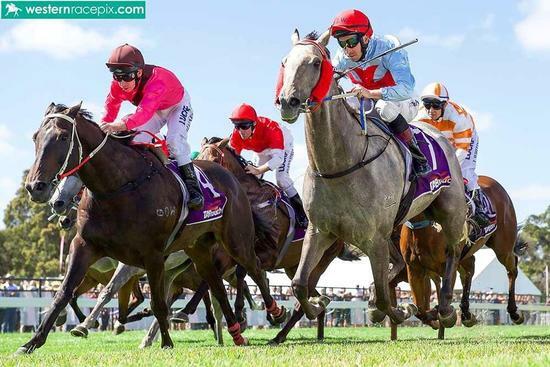 7 wins from 1200m to 2000m, A$144,175, to 2017-18, Alice Springs Cup. Mr Pago (g. by Magnus). 5 wins. See below. Black Energy (g. by Bel Esprit). Placed at 3 in 2016-17 in Aust. ASHLAN - RICKFIELD (H.K.) (Dansili). 5 wins at 1800m, 2000m, €60,700, HK$2,265,200, to 2016-17, Maisons-Laffitte Prix Matchem, L, Saint-Cloud Prix Magister, HKJC Sing Woo H., Cricket Club Valley S., Maisons-Laffitte Prix Diatome, 2d HKJC Mars H., 3d HKJC Wong Nai Chung H.
Ashkannd (Sinndar). 5 wins from 1600m to 2400m, €42,600, A$163,480, to 2017-18, ATC McGrath Estate Agents H., ANZ Bloodstock News H., Hyland Race Colours H., TAB Rewards H., 2d Saint-Cloud Prix Sea Bird, ATC TAB Place Multi H., Tab.com.au H., 3d Saint-Cloud Prix Turenne, L, VRC Neville Begg H., ATC McGrath Estate Agents ACT H., More Than Ready at Vinery H., McGrath H., Saint-Cloud Prix Good Luck, Deauville Prix de Crevecoeur, 4th Saint-Cloud Prix de Pontarme, L, Le Croise-Laroche Grand Prix du Nord, L.
Ashutor. 2 wins at 2200m, 2300m in 2017, 2d Saint-Cloud Prix Phil Drake, 3d Chantilly Prix de Chauvry. Amacali. Winner at 1500m, Chantilly Prix Magic Night, 3d Chantilly Prix de la Route Tombray. Asagild. 5 wins from 1500m to 1800m, €83,250, 3d Deauville Prix de Blonville, Prix du Val Rocher. Ashalina. 3 wins-2 at 2-at 1400m, 2d Longchamp Prix de la Grange Aux Belles. Producer. Anantara. 2 wins-1 at 2-at 1200m in Argentina. Invertiel. Winner at 2 in Sweden, 2d Jagersro Svenskt Derby, Deauville Prix de Prail, Prix des Commeaux, 3d Taby Jockeyklubbens Jubileumslöpning, Deauville Prix d'Angeville. RICURA (Wheaton). Champion 3YO Filly & Older Female in Panama in 2010 & 2011. 6 wins-1 at 2-from 1000m to 1700m in Panama, Panama Clasico Louis, Rosita Martinz y Alejandro Posse, L, Clasico Temistocles Diaz Q, L, Clasico Laffit Pincay Jr, L, 2d Panama Clasico Arturo, Eric, Max, EA y EA Delvalle, L, Clasico Tomas Gabriel y Tomas Altamirano Duque, L, La Rinconada Copa Dama del Caribe, L, 3d Panama Clasico Augusto Samuel Boyd Paredes, L. Producer. San Se Acabo (Sweetsouthernsaint). 11 wins to 1400m to 2018 in Panama, 2d Panama Copa Velocidad del Caribe, L, Clasico Navidad, L.
QUIET AMERICAN (Fappiano). 4 wins from 1m to 9f, US$754,650, Aqueduct NYRA Mile H., Gr.1, Del Mar San Diego H., Gr.3, Hollywood Park Allowance, Santa Anita Allowance, 2d Belmont Woodward H., Gr.1, Santa Anita Charles H Strub S., Gr.1, Goodwood Goldings 2YO S., 4th Santa Anita San Pasqual H., Gr.2. Sire. KAPALUA (Caro). 6 wins, Assiniboia Downs RJ Speers H., L, 2d Canterbury Turf Classic H., L, Assiniboia Downs Manitoba Crocus H., 3d Assiniboia Downs Wheat City H.
LIGHT CAT (Indygo Shiner). Champion Imported 3YO Filly in Puerto Rico in 2013. 5 wins-1 at 2-from 6½f to 9½f in U.S.A. and Puerto Rico, Camarero Clasico Ano Nuevo, L, 3d Camarero Clasico Dia de Los Padres, L.
NEENA ROCK (Fastnet Rock). 5 wins from 1200m to 1600m, NZ$104,250, A$112,050, ATC Angst S., Gr.3, WRC Cuddle S., Gr.3, Life Pharmacy Queensgate H., 3d ATC Sheraco S., Gr.3. Race Record: 56 Starts 5-10-8 A$187,105. 5 wins-2 at 2-from 1000m to 1900m, A$187,105, to 2017-18, SAJC Projection Graphics 2YO H., 2d VRC Henry Bolte H., SAJC Little Mick Yelland H., Sale TC Laurels Function Centre H., 3d Albany Cup, VRC Flemington 1840-2016 H., WATC Broome International Airport H.